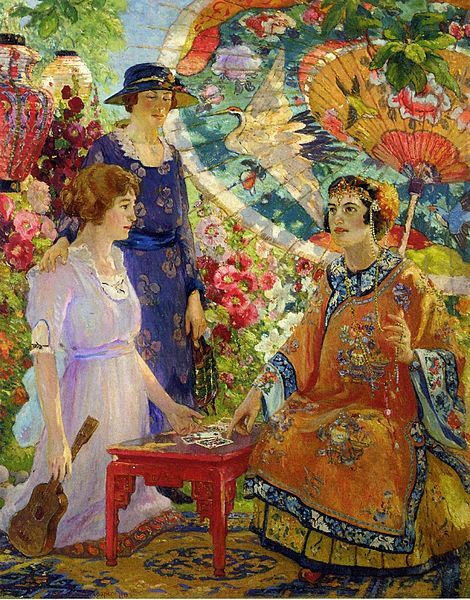 Colin Campbell Cooper, Fortune Teller, 1921. Cooper was an American impressionist painter who was on board the Steamship Carpathia in April, 1912 with Jan when it came to the rescue of the Titanic. Jan was sound asleep in his bed when the ship he was sailing on began to vibrate violently, jolting him awake. He and the five other men in his berth awoke to find the ship fully lit, and a cold chill enveloping the room. Strangely, the heat was off and the ship was travelling faster than it ever had in the three days since it left port. His room was usually quiet but on this night he could hear a loud commotion in the boiler room. Urgent voices yelled back and forth a midst raucous clanging and banging. Jan sprang to his feet and made his way to the deck where he joined dozens of other curious passengers and where the awful truth was soon made apparent. Another passenger ship had sunk in the frigid waters, and the Carpathia was hurriedly making its way to the rescue. It was not unusual for Slovaks such as Jan Bohuš to travel back and forth from North America to the Austro-Hungarian Empire in the early 1900’s. Nearly all of the 550 trans-Atlantic passengers on the Carpathia’s third class roster that night were “birds of passage,” more migrant workers than immigrants who had originally come from impoverished villages in Central Europe to find work in the United States, and who were traveling back home to visit family laden with a few goods and some hard earned cash. Most fully intended to eventually move back to their villages, and to settle down on land bought with money earned in the slave-like conditions of the mines and factories of the States. Most never did. 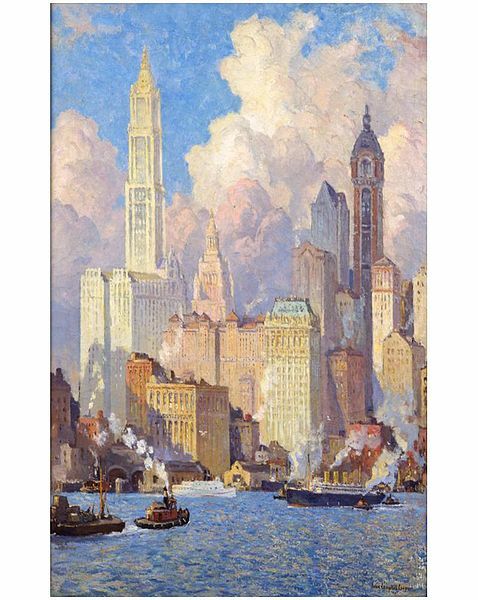 Colin Campbell Cooper painting, 1912. 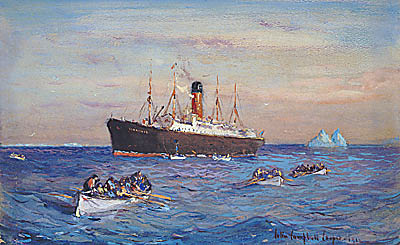 Rescue of the Survivors of the Titanic by the Carpathia. Several rescued passengers died aboard the Carpathia of exposure. Crew members scurried around the ship, preparing rooms for survivors, collecting blankets, preparing soup and hot drinks, and turning the dining rooms into makeshift hospitals. Jan and the other passengers were moved together in a group, away from the hectic activities. At 4am, the Carpathia’s engines were cut off, and a dead silence descended. Passengers on deck along with the crew strained to see something, anything, in the water around them. Finally a crew member saw a green glow coming from a flare in a lifeboat, and the ship carefully made its way towards the light. Ten minutes later Jan watched as the first survivor was hoisted onto the Carpathia; over the next four and a half hours, 711 more would be pulled aboard. Colin Campbell Cooper, 1912. 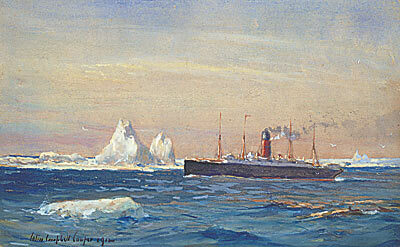 View of Steamship Carpathia passing along the edge of the ice flow after rescuing survivors of the Titanic. As it sped through the waters to reach the Titanic, it narrowly missed 11 icebergs. There wasn’t enough food on board for the Carpathia to continue on its way to Fiume, Hungary (now Rijeka, Croatia) with all the additional passengers, and so the ship turned around and four days later pulled back into the the Hudson River port in NYC. Colin Campbell Hudson River Waterfront NYC, 1913-21. Jan and the other third class passengers hung out on the ship for the next few days, enjoying three good meals a day in their own private dining room and freshly washed sheets each day; life was better on the ship than on land for most of these passengers. Finally the Carpathia set sail again, and enjoyed an uneventful voyage to Hungary. Jan's wife, Lenča, lived in Petrovec, Vojvodina (now part of Serbia) with their four children. Jan, however, continued to live and work in the United States, sending money home monthly, and travelling back every three years to see his family. Tragically, Jan died in a factory accident in Ohio a few years after the sinking of the Titanic, just another "Hunky" labor statistic. 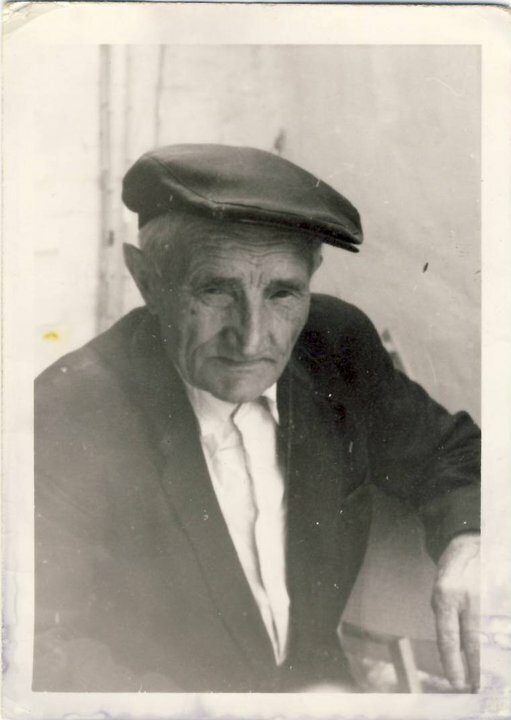 This is a picture of their only son, Jan Bohuš Jr, the grandfather of my relative, Jaro Miklovic. Labor statistics on factory deaths in the 1900’s. What a great story. More like this need to be told and retold to offset the ignorance of the current generation who actually believe the Titanic story was just a movie. Yes, there was an article last week about people who were actually saying just that. Interesting! What fun you must be having learning so much about your ancestors and history. It’s great fun to tie family stories to historic events. The sinking of the Titanic struck a personal note with my family. My grandfather boarded a german ship for New York the following morning. He had traveled from Slovakia and was determined to start a new life for his wife and baby. Would you have boarded that ship the next morning after learning of the sinking?? I can imagine how he felt. A few years ago I flew Air France to Paris hours after the plane from Brazil enroute to Paris disappeared over the Atlantic. It was unnerving. I enjoyed the story. My ancestors were from Slovakia. I am looking forward to following your post. Thanks. Have a great weekend. Hermosa historia. Tristísimo el fin de los pasajeros del Titanic, pero una vez mas, se demuestra, que (cuando no interviene la política), al ser humano lo pones al límite, saca fuerzas inimaginables para ayudar a otros seres en apuros, convirtiéndose en héroes. También las imágenes que acompañan el relato son magníficas. This is the first time what I am checking your blog! Love the history. I am Slovak living in USA and was very happy to see your stories from Slovakia. The story about korbaciky was very close to me because I grew up in Ruzomberok. Please continue!